Ice Cream Craze: Tycoon Takeover is rated 3.9 out of 5 by 13. Rated 5 out of 5 by J9CT from Fast-Paced Fun Game!!!! 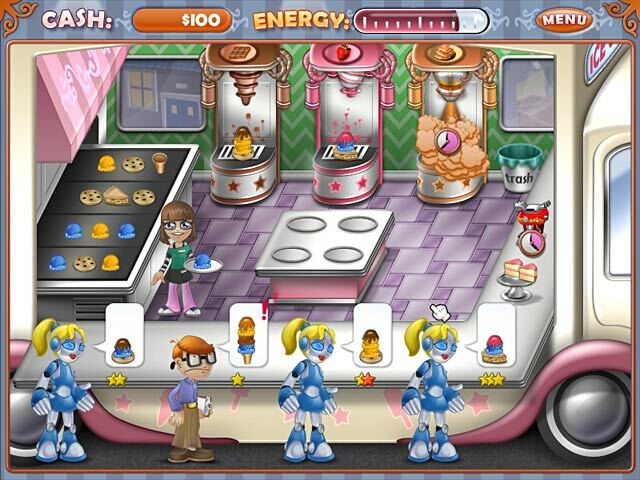 Good stuff: Very challenging Demanding customers with huge orders Earn money to open new saloons and upgrade truck etc In-store upgrades Espresso for speed Cake/muffins to keep customers calm Bad stuff: Wrist gets sore after playing for a while Replayable, fun and challenging game that never gets old. 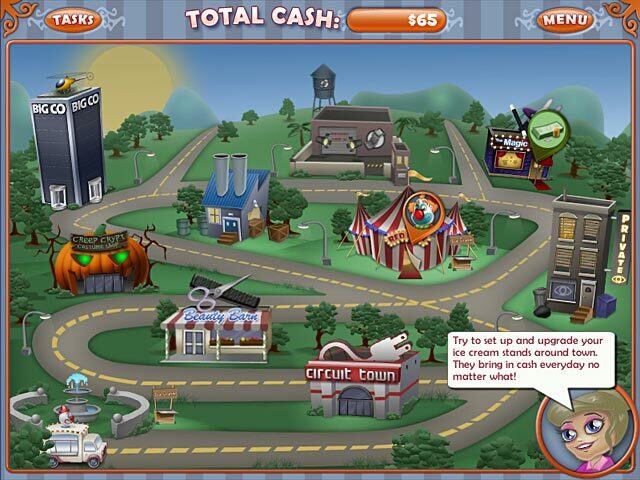 Rated 5 out of 5 by FORTUNATUS from Charming, fun, silly game.... Despite it's cartoony, dated graphics, I have had a lot of fun meeting the challenges in each level of this silly little TM game. A "casual" game in the true sense of the word... in my opinion, it should not be overlooked. Cute & delightful to play with all it's simplicity and quirkiness. 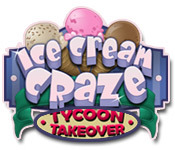 Rated 5 out of 5 by tailswhiskers from Ice Cream Craze: Tycoon Takeover I played the game and I loved it. To me, it was relaxing. The higher you go the harder it gets. I only wish I had more time to play the game. As you go, you get throught the challanges, you go on to another place located in the scene. Rated 4 out of 5 by scoonerz from I very much enjoyed I do not see where the last two reviews can in all honesty say the graphics are bad and/or distorted, I assume they need to upgrade they're video cards! The graphics on this game are astounding and I enjoy the fact that I can choose where to spend my coins although it is some what aggravating to lose your progress if you make a mistake but I am competitive so it just gets me going all the more. To me this game was challenging enough, I really enjoyed this game! Rated 4 out of 5 by GothicJawa from Enjoyable I seem to be one of the few who loved this game! I can agree with some of the downsides that the other reviewers mentioned, such as being a little slow at the beginning and the fact that if you make a mistake during a round it causes a great nuisance. Every time I made an error, I just quit to the main menu and got back in (and still had all the money I had spent to play the level) and replayed the level. One of the things I liked was that this gave me more of a challenge than many of the Dash games, because of how impatient certain characters are and the money disappears if you don't pick it up. It was a little frustrating at first but once you work out a strategy it's quite good. I also loved the different characters and the dialogue boxes when you went to do a mission; particularly some of the weird things the Clown said. I loved this game and am glad I bought it. Not everyone would, but if you're generally entertained with TM games you should find this a fun, cute and quirky little game. Rated 4 out of 5 by nancyj23 from Not too crazy ice cream craze It took me a few levels to get the hang of this game, but I ended up playing out my trial time and had to buy it. Once you get past a few levels, you are given a choice of the next 'shop' to play for a specific award or upgrade. If you are successful, you earn the reward and some cash which allows you to progress on the map. If you fail, you lose the money you paid for the level at which point you can retry or play another opened venue. The characters and story line are cute & amusing. 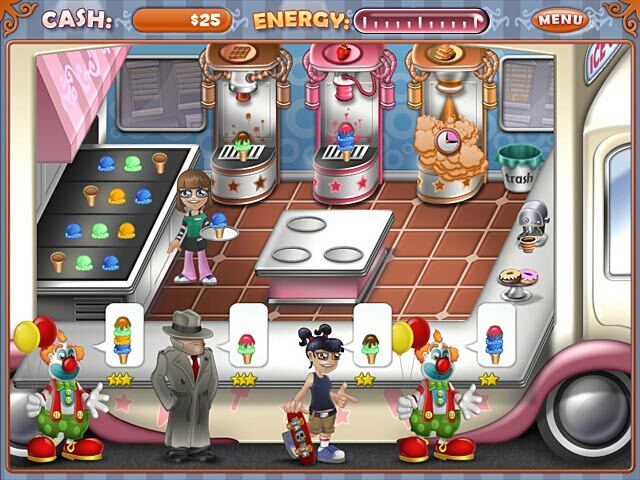 The ice cream choices are varied enough to make this a challenging, but not frustrating game for me. I like that I have a choice of which shop & bonus to play for each day.